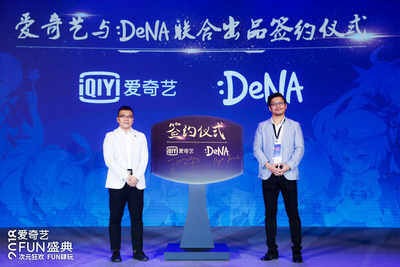 BEIJING, Nov. 23, 2018 — (PRNewswire) — iQIYI Inc. (NASDAQ: IQ) ("iQIYI" or the "Company"), an innovative market-leading online entertainment service in China today announced it has signed an agreement with Japan's DeNA Group to adapt two of DeNA's most popular online light novels, "S" and "The Sweet Revolution", into comic form. The wide-ranging agreement also focuses the two companies' work on building a new "IP value sharing" model in the entertainment industry. The "IP value sharing" model behind iQIYI and DeNA's agreement differs from the traditional model for content adaptation used in the industry, which generally grants rights for adaptations exclusively to the original writer, with content platforms only granted broadcast rights. Through this new agreement, both iQIYI and DeNA will have full rights to adapt the promising IP of the newly adapted comics into content including games, animation and films, the first time such an agreement has been made between Chinese and Japanese entertainment companies. Founded in 1999, DeNA Group is one of the world's leading internet companies with services covering games, e-commerce, entertainment, socializing, healthcare, and automation throughout South Korea, China, Singapore, and Vietnam. The agreement opens up the potential of similar adaptations being made for other content on DeNA's "EVERY STAR" online light fiction novel platform, which is home to more than 1.41 million authors and more than 2.3 million novels. The two online novels which were chosen to begin the two companies' new partnership have been a hit with audiences in both Japan and China, with "S" being ranking first multiple times on EVERY STAR's monthly Sci-FI/Suspense rankings and "The Sweet Revolution" being selected as one of EVERY STAR's "Youth Novel Special Collection," as well as named as the winner of Poplar Publishing's "Pocket Chocola" pure love novel competition. "iQIYI's new agreement with DeNA allows us to more easily export the beloved IP of online fiction to a greater variety of content formats and realize their commercial potential, which is good news for both fans and our bottom line," said Geng Danhao, Senior Vice President of iQIYI. "DeNA Group is one of the world's most respected players in the global gaming and entertainment industry and their extensive EVERY STAR collection of online fiction provides a valuable resource for iQIYI as we continue to provide our users with the best in premium quality entertainment content." Anticipating the continued and growing popularity of young adult animation and comics, iQIYI launched its "Welkin Project" in 2017, which is specifically aimed at adapting comics IP into high quality productions. At present iQIYI has already signed contracts with several online drama production companies for the adaptation of comics into online dramas. In a recent example, a live action drama adaptation of the original comic IP "Conspiracy of Love," started filming in Dalian this July and is expected to debut in spring of 2019.